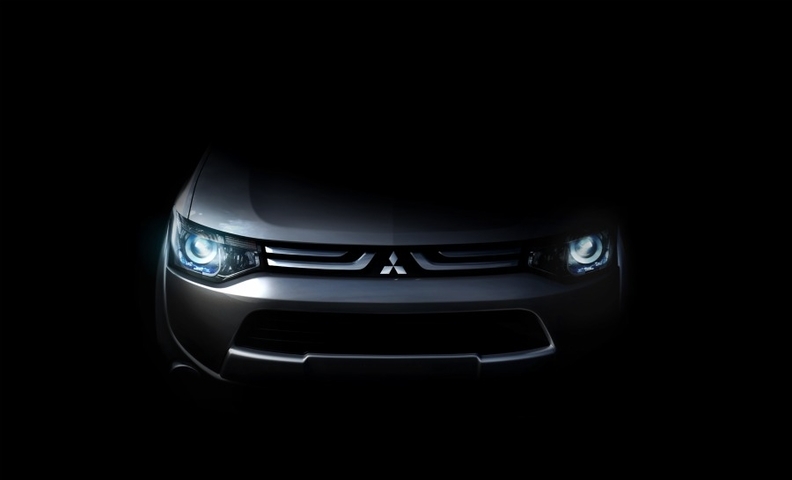 Mitsubishi's teaser for its Geneva debut ditches the automaker's aggressive 'jet fighter' grille. Mitsubishi will debut an all-new vehicle at the Geneva auto show in March, but won't confirm that the model will be the next Outlander SUV. A teaser picture of the vehicle shows a similarity to the PX-MiEV II SUV concept unveiled at the Tokyo auto show last November. Mitsubishi general design manager Hiroaki Ohtsuka told Automotive News Europe at the Tokyo show that the design of the PX-MiEV II was "70 percent" that of the new Outlander. In a statement on Thursday, the automaker said the new model "reflects a gradual transformation in Mitsubishi's design language." Mitsubishi said the Geneva debut would be a "strategic and innovative premium vehicle," but declined to say whether it previewed the new generation Outlander. In Tokyo, Ohtsuka said the company is to ditch the aggressive 'jet fighter' grille in favor of a more friendly look to signal a change in philosophy. "Up until now Mitsubishi has focused on driveability and SUV development," he said. "Our new initiative shifts focus to more environmental aspects." The new Outlander is set to launch in Europe in November. The SUV will be also available as a plug-in hybrid in Europe in 2013. Mitsubishi has said it wants electric and plug-in hybrid vehicles to account for 20 percent of sales by 2020. A Mitsubishi spokesman said it was "too early" to say whether the new model will be shared with PSA/Peugeot-Citroen. The Peugeot 4007 and the Citroen C-crosser are based on the Outlander. Unlike the current Outlander, the new model will not be built at Mitsubishi's NedCar plant in the Netherlands. The plug-in hybrid version will be produced in Japan, but Mitsubishi has not said where the standard model will be built.